My gig in Belfast which was to be in No Alibis has been postponed til next year because it clashed with a songwriting workshop Christy Moore is hosting which I was luckily selected for. Many thanks to Dave in No Alibis who is a very cool guy. I’m still looking forward to the gig which will probably be in February. Seo hé pictúir agus píosa a bhí in eagrán 9 don Iris Nós* mar gheall ar an gCabaret Craiceáilte i mí Márta. Agus thíos an eagráin go léir! Had a great weekend at electric picnic playing in the Irish Tent (Pobal Gaelach) every day. On friday after spending quite a while in traffic (thanks to Dave Conway of the DC Experiment for the lift!) I got to the picnic grounds after a long walk throught the muck, got the tent up and went straight to the Irish tent in the Mindfield area to do my gig (40 mins in Irish) which was a nice start to just get stuck in! My new song Dónal Ná Fág went down well and I did a version of The Lakes of Ponchartrain in Irish too. My other Irish songs which I sang were Cur an Long ag Seol, Mol an Aimsir, Ceol as an Dorchadas, an Bainne Dearg and A Ógánaigh an Chúil Cheangailte. 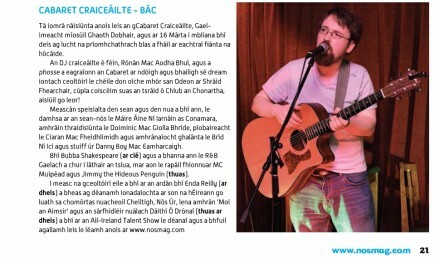 On Saturday and Sunday I played as part of the Cabaret Craiceáilte which had a great line up including Doiminic Mac Giolla Bhrighde, Bubba Shakespeare, Fiach, Máire Áine Ní Íarnáin, Darach Mac Mathúna, Tura Artura and Kila. Thanks to Enda Roche (Brown Bread Mixtape) and Mark Flynn (Lazy Band and Blood Red Mountain Band) who played Djembe and Mandolin resp. in the Sunday set with me at very short notice. 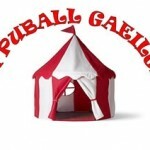 I’ll be playing a gig in Irish at 6pm Fri in the Irish tent and also in the Cabaret Craiceáilte on Sat 6.30 and Sunday 7.30 in the Irish Tent( Pubail Gaeilge) in Mindfield Area, Electric Picnic. Also i’m presenting a music radio show in Irish on Body and soul fm on Sunday. I’ll also be playing in the External Sounds Body & Soul FM & Tent! Beidh mé ag seinnt ag 6i.n. ins an Pobal Gaelach ag an Electric Picnic. Agus ag an cabaret Craiceáilte ar an Sathairn 6.30 agus an Domhnach 7.30 ! Scaip an scéal! Freisin beidh chlár ceol á láiriú agam ar Body and Soul Fm.